Being an American, who was born to Indian parents.. my son is still not used to eating very spicy food like any other Indian kid (in India) of his age...But he doesn't mind a little black pepper powder in his food... So I came up with this chicken curry specially for him, so that he knows the Indian flavors but without the red chili or too much spiciness. PS : The adults in my family also loved this version. They thought it was a nice change from the monotonous Indian style spicy chicken curry. First marinate the chicken with salt + Turmeric + Mustard oil. At this point I have tried adding a bit a black pepper powder too, no one complained. When oil's hot, add the garlic & let it get fragrant. Now its time to add the chicken pieces. For the first 5-7 minutes, fry the chicken - uncovered in high heat. This is to get the browning on the chicken. Next 15 mins, cover the chicken and let it cook until soft. Add garam masala at the end, give a good mix & adjust for seasonings. Server with roti or Dal+Rice !! The classic combination of green beans, cauliflower florets & bright orange carrots always reminds me of the Indian national flag... the ever so loved & respected... Tri-color Flag.. The Indian national flag has three stripes, Saffron (aka Orange) followed by White followed by Green. Each color symbolizes a trait that the nation follows. Saffron/ Orange shows strength & courage, White shows peace & Green shows growth. The flag also has the "Dharma Chakra" (Wheel of righteousness) in the middle. I remember back home, Baba will take out his National Flag & proudly let it fly on our roof top on every national holiday like the Republic Day or Independence Day. 8 -10 green beans, trimmed & cut into small 1/2 inch pieces. 1/3rd of a cauliflower, cut into small florets. 2 medium sized carrots, scrapped & cut into small cubes. Server hot with White rice + dal. Then all the sauces... & done !! Note : Since my son does not eat too much hot sauce (yet), I added the red chili & sriracha sauces later, after I spooned out his portion in a different bowl. Also, I did not have scallions or green onions to sprinkle on top, but if you try this.. it'd be nice !! Poha (left over from last evening).... I am sure we can use the MTR ready-to-eat poha as well..and it will work just fine..
add the poha.. give it a good mix & done !! "Santula" is a very good dish.. I have no doubts about it in my mind.. but having it almost every night is not advisable for our stomach's & heart's sanity !! So here it is... a simple tawa fry type preparation... with green & orange bell peppers (we Indians call it Capsicum)... and potatoes... its not a santula so.. everyone's happy ... and went perfectly with roti.. Method is very simple... heat oil & splutter cumin seeds .. add the veggies, salt & turmeric & fry until they are soft...mid way through add pepper & subjee masala.. serve hot with roti. Sweet coconut stuffing + fluffy, soft white rice flour dough cover + 15 minutes steam = Yummy yummy Panda pitha !! sweet coconut filling - Recipe here. Put water on medium flame & add sugar, salt & ghee. Get the water to a boil & lower the flame to lowest when water starts to boil. Mix the rice flour little by little into the water. Keep staring the mixture continuously, else it'll form lumps that'll be difficult to handle later. When the mixture has come together, turn off heat & cover the pan. Keep the mixture covered for 10 mins. It'll be still warm & you should be able to handle the mixture. We'd need to knead it to a soft dough. Knead the dough to a super soft dough, fluffy & white !! 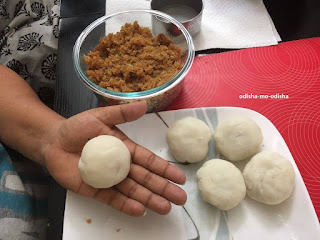 Next make small balls of the dough, flatten them with your palm (use water or oil to handle the stickiness of the dough), fill with sweet coconut stuffing, close the balls. Once all balls are ready, steam them for 15 minutes and all done !! My family... we love chicken... especially if it is spicy.. well... we are Odiyas and we love spicy chicken.. whats new in that??? Well... I skipped the deep frying... skimped on marinating ingredients... added tons of veggies.. and viola.... Our super easy stir fry chili chicken was ready... We had it once with Roti & another time with Rice & Dal... both the times... we finished the whole pan full... Well yes.. we are Odiyas.. and we love spicy chicken !!!! Heat olive oil in non-stick pan (I tried with Calphalon stainless steel & it did not work good for me.. mainly because of the ginger garlic paste). When oil's hot, add the garlic + celery & fry for 30 seconds. Next add the chicken & let it brown & cook at the same time... how to do that? Well its easy... you cover & cook the chicken on medium to high heat... Yes, you can not leave the kitchen while that is happening... there's a risk of food burning.. When chicken is done, add the veggies & ketchup, chili sauce (skip if you don't want too much spicy) & soy sauce.. and stir. When the veggies are cooked yet crunchy... adjust salt & pepper... turn off heat & serve super hot ! !